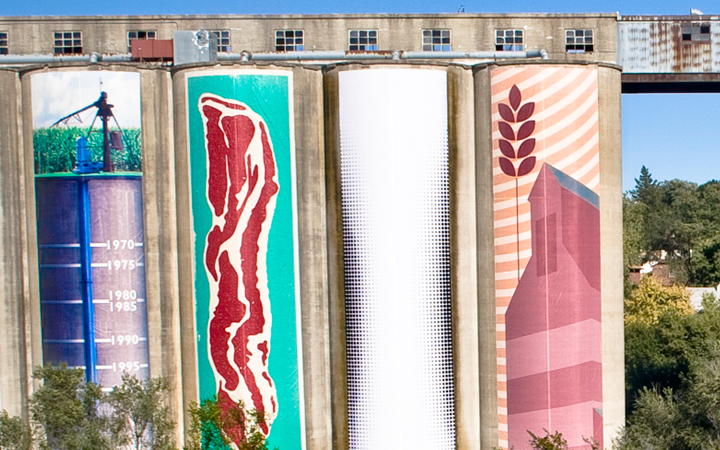 A large-scale art installation on a prominent unused grain elevator. 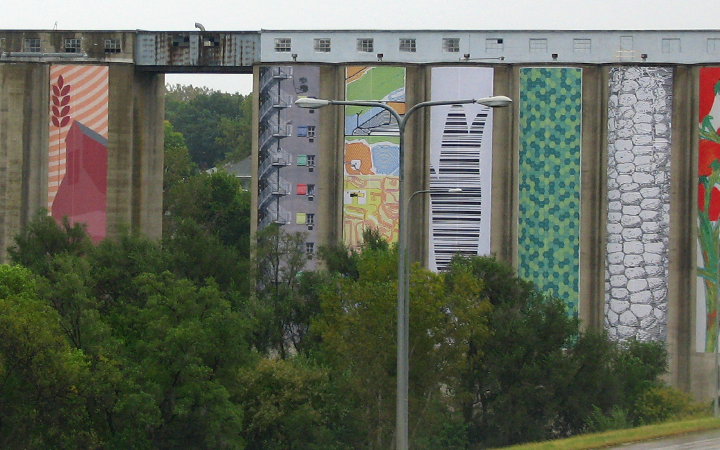 Empty grain elevators are transformed into public art. 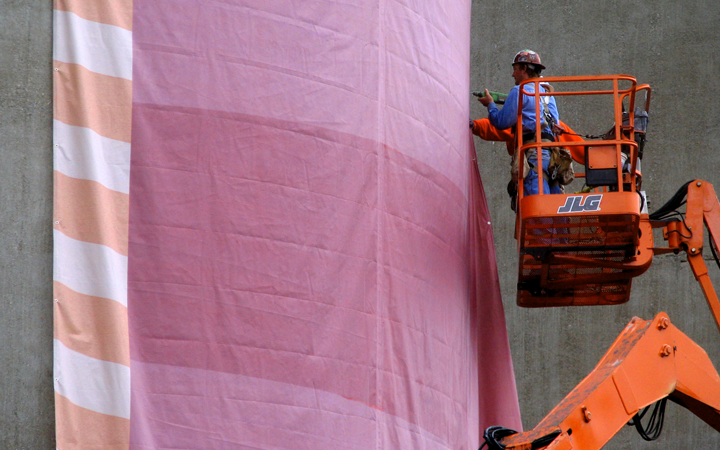 The Stored Potential project began as a desire to do something with a grain elevator that had become visual white noise to 76,000 daily passing commuters. Emerging Terrain partnered with the elevator owners, city agencies, neighborhood associations and various community organizations to make the project happen. 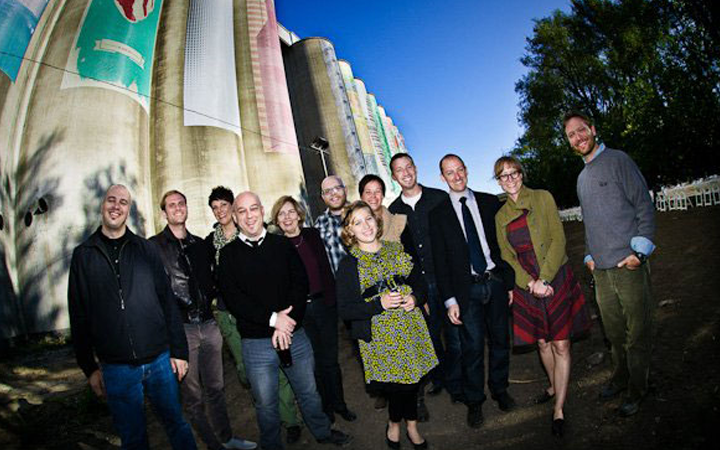 They solicited artists to submit designs that would be installed on the exterior of 13 elevator silos. Artists submitted designs based on their interpretation of the interrelatedness between land use, food, and agriculture. 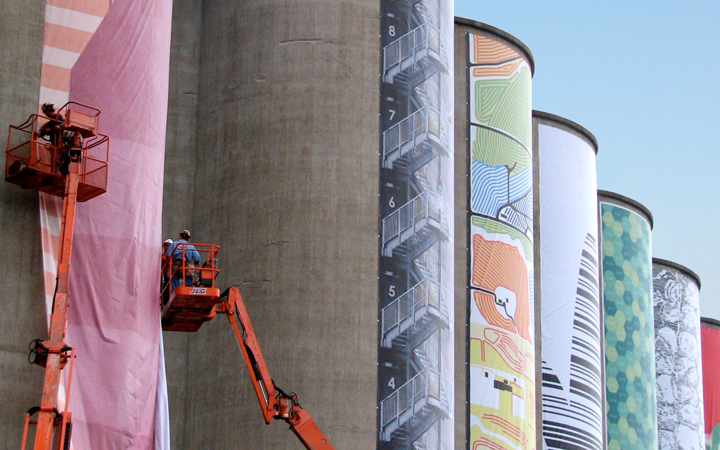 The designs were printed at the scale of the enormous structure—each piece measuring 20’x80’—and hung to wrap the concrete cylinders. The finished project was celebrated with an outdoor dinner party with 500 people, all of whom were seated at an 800-foot-long table. 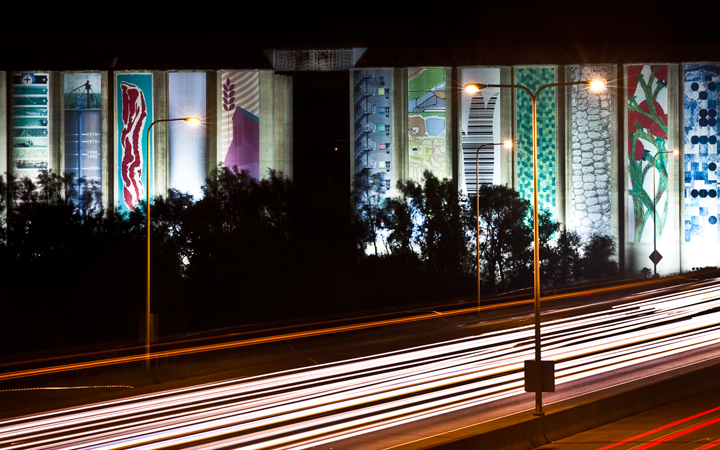 Reviving an area of grain elevators at the juncture of I-80 and I-480 was the goal of the Stored Potential mural project. 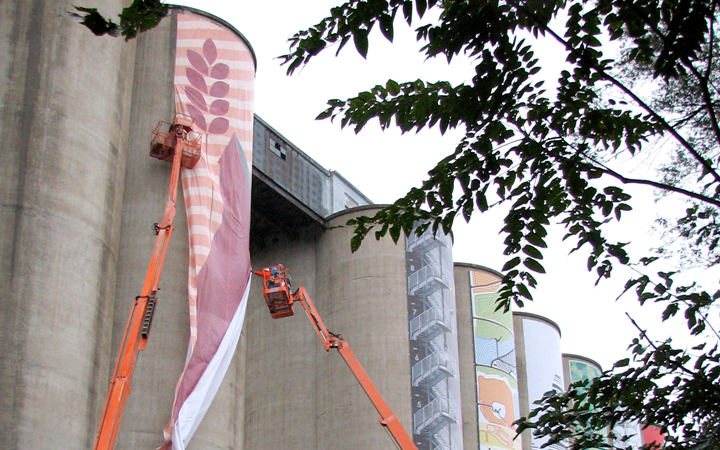 A call for submissions went out to artists to create designs for 20’x80’ banners that would hang on one side of a silo. 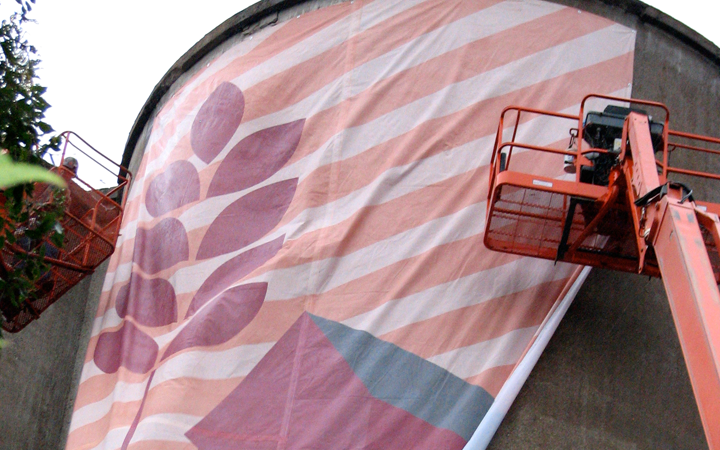 Each artist was instructed to interpret the theme of interrelatedness between land use, food, and agriculture on a single banner. We chose to focus our design on the drive shed. Influenced by the structural elements of grain elevator architecture, the drive shed represents the history and vibrancy of these nostalgic Prairie Skyscrapers. Drive sheds had their own architectural personalities despite being so small in comparison to the silos they stood beside. They were as unique and interesting as the elevators themselves. Humble wood structures, the drive sheds function was to protect farmers from the weather while they unloaded their grain. An iconic design style made up of a simple line and shape, together with graphic bold colors, the drive shed becomes the focal point, rather than a supplemental structure. The use of scale pays homage to its purpose. The giant wheat stalk stands as a representation of all the grains that have filled the silos and fed families, not just in consumables, but as an employer, customer, investor, and a vital commercial hub, for generations. The striped curve pattern in the background is an abstraction inspired by a hand forged silo in rural Nebraska from the 1930′s. We are a social impact design studio creating equitable and powerful solutions with people, not just for people. We create meaningful brand experiences for the community to see, think about and react to. "Cathy and the Wheelhouse team have been fantastic and the final product is amazing! They took the time to get to know us, and our work, and helped us craft both a brand and message that will be essential to growing our business. I can't recommend them enough!" © Copyright 2019 Wheelhouse Collective. Development by Scott Blaine.